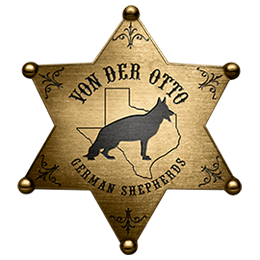 As a Texas German shepherd breeder of World Class 100% Pure German blood lines of VA/V rated dogs we are committed to only offering the best out of Germany and Europe for our customers. Our breeding dogs are bred to to some of the most famous well produced studs in the World. The dogs in our pedigrees are easily found with vast information on the internet with many videos and pictures of bitework and ring work in top National shows. We strive to breed only the highest quality german shepherds in America and we work hard to keep the integrity of the breed. Our puppies for sale come with a written guarantee, microchip, AKC papers, pedigree, worming and shot records. The parents and grandparents are DNA and DM tested, hips and elbows certified, AKC registered and German pink papered. We offer climate control shipping of all our puppies and dogs throughout the United States. The heart of our business is the strong relationships we build with our customers everyday and the solid foundation we earned throughout the years in Europe from people we can trust and who trust us with top German imports. Every year we hand select dogs to add to our breeding program to improve the breed. We travel to Germany to see the dogs in person and deliver our dogs for training. After training, we breed our female to the top VA stud in Germany and bring them home to America. The pedigrees of our upcoming breeding females and breeding males are out of some of the most current Sieger Champions. Some of the most known dogs in Germany are in our pedigrees, which include 2X World Sieger VA1 Vegas du Haut Mansard, VA2 Quantum von Arminius, VA2 Quenn vom Löher Weg, 2X VA1(CN) Furbo degli Achei, VA1 (USCA) Nino vom Tronje, 2X World Sieger VA Remo vom Fichtenschlag, VA Orbit von Tronje, 2X World Sieger VA1 Rikkor von Bad-Ball, VA Hill vom Farbenspiel, World Sieger VA Ursus von Batu and VA (WDA) Whisky von der Wasserkuppe and many more. Why Top German lines make such a difference? The West German lines from Germany are tested for years to insure they are qualified for breeding. Germany will not breed two dogs together just because they are purebred. It takes much more then that to get a German shepherd papered in Germany. To receive a World Sieger Champion VA/V title takes years of continued work to achieve. This gives them an advantage over the standard American German Shepherd dog you see today. The West German bloodlines are bred for great attitudes and superb temperament making them extraordinary in show, search and rescue, service dogs, protection and most all the ultimate family dog. Why we earned 5 ratings by our customers? At Von der Otto we spend many hours with our customers learning their needs, encouraging them to visit their puppy each week and answering any questions. We make a point to keep in touch with the families throughout the puppy's life. Communication, honesty and the relationship we build with our customers are very important to us. We have been blessed with some of the best customers in the world. Many customers appreciate the special touch we can give as a small kennel owner. We are able to give our customers, the puppies and our dogs the time and attention that most large kennel s just cannot do. This alone makes a huge difference on socialization of a puppy. At Von Der Otto we realize our success depends on the relationship between us and our customers. Our goal and continued commitment to you! The product we highly recommend for all dogs is NuVet, this is a vitamin that is like a treat for your dog. The dog's coat, within a month giving one tablet a day, you will see less shedding, extremely soft and shinny coat. Comments from a couple of people who tried NuVet and loved it. Comment by Mary Clark, "Tia, just wanted to say thank you for bringing me the NuVet and conditioner a few weeks ago. OMG I cant say enough good things about it. Ruby's coat is shiny, thick and she doesn't smell anymore. She also literally doesn't shed. When she would sleep on my bed the hair was so bad that I had to stop letting her in my room all together. Now she sleeps on my bed and when she gets up there are about 5 hairs. This stuff is amazing!!!!!!!!!!! Just ordered a year supply. No more vacuuming 5 times a day, im now vacuuming once a day!" and a Comment by Patsy Ferguson, "I had connected Von Der Otto, because my girl just wasn't healthy, I was impressed with how healthy their dogs looked. My girls coat was rough, losing hair, and her eyes weren't sparkling. Von Der Otto highly recommended NuVet Plus. They told me it would take about a month before I would see a difference. After a month she is beautiful! Her coat is soft, eyes sparkling, no hair lose, and she's full of energy! Thank you so much Van Der Otto for your help." More recommended items click on this link German Shepherd Recommended products and supplies list!